Pizzeria Uno’s is one of Chicago’s most famous pizza places. You can make a similar deep dish pie at home. Thanks to QueenBerta for this recipe. Make Uno's Pizza at home. In large mixer bowl, sprinkle yeast into warm water. Stir till dissolved. Stir in 1 1 /2 cups of the flour; the 1/3 cup oil, and 1/2 teaspoon salt. Beat at low speed 30 seconds, scraping bowl constantly. Beat for 2 minutes at high speed, scraping bowl often. Stir in as much of the remaining flour as you can. Cover, let rise in warm place till double. Punch down. Let rest 5 minutes. 4. Turn dough into the pan. Using oiled hands, spread dough evenly over bottom and partially up sides of pan. Cover; let rise till nearly double, about 30 minutes. 5. Arrange cheese slices in 1/4-inch thick layer on dough. Gently press sausage on cheese. Using hands, gently crush tomatoes into small pieces atop sausage. Sprinkle with herb and Parmesan. 6. Bake in a 500-degree oven for about 25 to 30 minutes or till edges of the crust is crisp and golden brown. If desired, sprinkle the pizza with sliced mushrooms or chopped green pepper during the last few minutes of baking time. let the pizza stand 5 to 10 minutes before cutting. The pizza yeast is great from Williams-Sonoma. It makes a great crust. I use only Bertolli Extra-Light Olive oil because it doesn't have a real heavy olive oil taste. This pizza recipe is not like the other Chicago deep-dish which uses yellow cornmeal, which has been made by other famous restaurants. 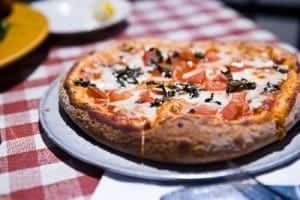 After eating at pizza Uno I will say that I’m going to make a pie dough with butter and shortening mix and experiment with yeast amounts after being a cook for 30+ years I can say that pizza uno’s crust is a risen pie dough more than an actual pizza dough. This shouldn’t be called Pizzaria Uno’s pizza if it doesn’t include cornmeal. While, it didn’t taste too much like Uno’s it hasn’t half bad. i have tried em all…NONE DUPLICATE the real McCoy There still are the best ever…(Along with a Michelob Beer. Uno’s uses Bisquick. 3 cups Bisquick to every 3/4 cups of water. I’ve said too much. One packet of active dry yeast? The 1/4 Oz packet? The 1/2 Oz packet? The 1 Oz packet? So far,all the recipes for real Chicago crust is the same and even look the same in picture,but fail in taste and texture.The recipes do not produce the crust of the famous pizzas, which is the pastry buttery biscuit like crust people are dying to replicate..You will not achieve it using all these recipes on the internet.The ingredients that you read in their pizza box,are only correct to a certain point.Fortunately for me I have learned this secret which I am not ready to share.The only thing I can say is that there are ingredients and techniques missing.Unless you employ them it will never result in the wonderful pizza crust!Everything from the flour to the fats are wrong with most of the recipes online. Thank you for your input. I am sure you have your reasons why you won’t share how to recreate this at home. Good point Stephanie………I’d tell the guy to PUT UP OR SHUT UP!! You won’t share? Then don’t ware our time blogging. keys to Uno’s style crust is inclusion of corn meal and butter, cold butter and ice water allow you to have a flakey biscuit style crust, these are borrowed from pastry recipes and is the only real difference…. What daphne said. Butter and “pizza dough flavoring” (sold in stores, they’re mostly grated cheese mixtures) are the two major secrets to pizzeria quality crust. Add 1/4c butter for every 3c flour, and 1-2T (2 if you’re smart) flavoring per 1c flour, and you’re done. The butter can even be melted, since it’s being added for flavor and not texture or flakiness. The yeast handles that part. Another secret to a wonderful pizza crust is the rise step in the oiled pan. I worked at the original Numero Uno in the mid-70’s in Northridge, they flavored the olive oil for these pizza pans with sliced garlic, and allowed generous rise times of at least a few hours. As the dough rises it absorbs these flavors and the results are truly amazing. This is not like Unos.Just a regular pizza crust.You won’t know any different unless you have had Uno’s Pizza. Pizza Uno now has a gluten free pizza. It is really good for those of us with celiac disease. Unfortunately, it’s really expensive and also, my nearest Pizza Uno is almost 2 hours away. Can you get to the bottom of this recipe, Please!! our Unos has gluten free pizzas and it is NOT expensive. prices range from $10-13. the same price for regular pizzas. they have a rather good gluten free menu. as for a copy kat GF dough recipe there are a few online at different sites. my advice is try different recipes until you find one you like. Thanks for your comments, I should do a gluten free pizza dough so everyone can enjoy pizza. I appreciate your comments and you dropping by to share your wisdom.